Looking a little lower, notice the three tabs for each backup option. The three main options for backups are FTP, SSH\SCP, and local backup. While each has it’s own settings pertaining to specifics of that protocol, some settings are the same between them. Some similar settings would be; enabling backup type, scheduled backup time, storage directory, and backup limit. The FTP and SSH\SCP tabs have similar but unique settings as well, such as server, port, username, and password. Once these details are filled in, you can test the connection and upload ability on remote systems, and folder permissions on local paths. Once your settings are tested and correct, press the Update Settings button to save the changes to any and all backup types. The next time you are here, these same setting will populate back in and you should see one or more green checked circles displaying which are enabled. Should you need to restore one of you backups, simply follow the Restoring From A Backup section on pg.2 of the Backing Up And Restoring Your Nagios XI System document. 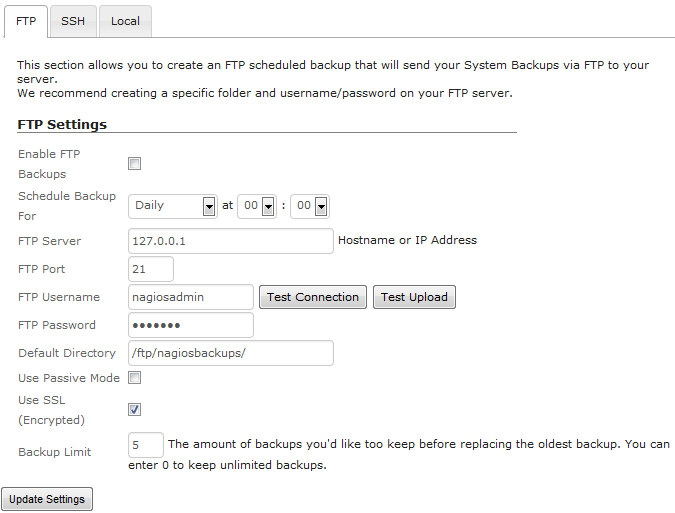 If you would like to try out the new Scheduled Backups Component and see the latest version of Nagios XI 2014 in action, you can give it a test run by downloading Nagios XI 2014 here with a fully functional 60 day free trial. This is the good future that you have provided in NagiosXI 2014. Can you provide also some more details about what script is going to executed in the background. 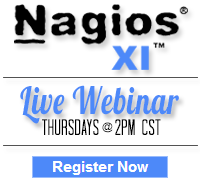 Use this script to backup Nagios XI.